That line is one my favorite lines from one of my favorite (probably my favorite) writing of Dr. King: Letter from Birmingham (City) Jail. It’s always resonated really strongly with me and it was also dated on my birth date, 16 April (I write and think about that speech often). Since I heard it, I’ve really tried to live believe it and feel it. I do genuinely think that deeply believing that idea is our (humans) only hope of getting out alive of the mess we’re creating of the planet and our societies. Well, last week, I felt that interrelatedness in new way. Normally, I would keep stuff like this to myself, but I’ve found that sharing it has done more good than not. And since my colleague, Curtis Ogden, has introduced me to “thinking out loud,” I committed to start trying it. So here goes. I woke up at 4:58a on Sunday morning. I know this because I have a timestamped text message that I sent to a friend. I intentionally don’t check Twitter in bed (it’s a mental safety mechanism) and I don’t have cable. No one had yet texted me anything about the Orlando situation, but around 5am is when a door was smashed down at the club and some people made a run for it. What’s weird about this for me is that I never wake up in the middle of the night. I don’t sleep much and when I go down, I stay down until I’m 100% ready to get up. Sunday morning I woke up, texted a friend, and went back to sleep. Why did I wake up? My dad always says people are more connected than we allow ourselves to acknowledge. Weird, right? (Full timeline of the shooting can be found here). My stomach was wrecked all week. After I started following the story on Twitter, my stomach promptly began to act up. I couldn’t place it so I initially assumed maybe I had eaten something bad on Saturday. Then I got to work on Sunday and person after person told me they were experiencing the same thing. And then as I started texting friends about it, they were reporting the same thing. Was it possible that 12 people I know had all eaten something weird over the weekend? I guess. But I actually think it’s more likely that our bodies (these were mostly queer folks reporting this) were processing this situation in a very physical way. Following live news stories is a sure way to achieve unfocusedness (all of the police shootings in the past while have taught me that lesson). So now when events like this happen, I usually allow myself some time to stay caught up on the news, but then I try to get work done. Usually what that means is I find myself a quiet room and turn off my internet (thanks, Jen Willsea, for those tips on focusing and minimizing distractions). But every day last week, my standard strategy didn’t work. Even with no internet and no external distractions, I couldn’t get my mind to stay tuned to any single thing. I would start a task and then start thinking about something else. Or I would try to do something that required sustained thought/creativity and get nowhere. And the more I talked to folks, the more I heard this same report. It was especially common from people in my friend circles who occupy “creative” roles (writers, artists), but definitely not exclusively. My conclusion? 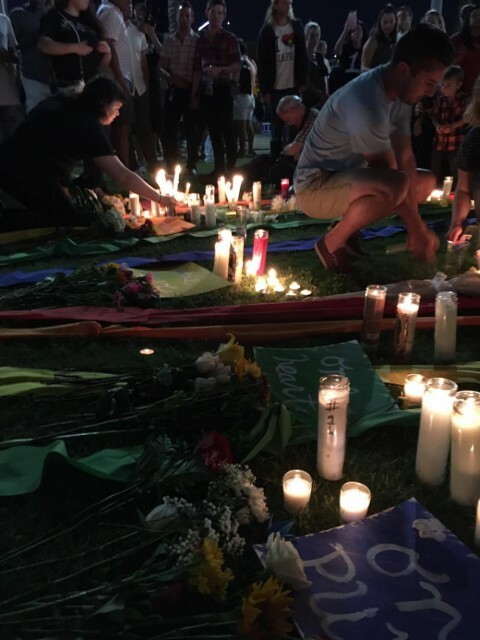 My body had a very physical reaction to a mass murder of queer Latinx people in my home state. And the more I share about it, the more I hear that my experience (or at least parts of it) wasn’t uncommon. What does all this have to do with our collective well-being and that single garment of destiny? To be honest, I’m not totally sure. I definitely know that a severely upset stomach and lack of focus (#firstworldproblems) don’t even come close to the experience of losing a child or friend forever. That said, I do know that that trauma like this is felt broadly and has very real implications on the well-being of our society as a whole. The implications go far beyond those who were directly physically, familially (is that a word?) affected. If we really are all connected and interrelated, it makes sense to me that (depending on our social distance from the trauma) we would feel a devastating event like this in a visceral way. I don’t like to focus on myself, but I truly believe the only way to move forward collectively is for everyone to start with a keen awareness of themselves. So I’m curious to know if any of this resonates with anyone else. Did you feel any of these things? Other things? Nothing? Hey. So I made this series of paintings as a healing process after the horrible news. After I posted it, it went viral, so I decided to double down in my art installation that I made at the vigil. Ever since, people have been making their own thing, getting tattoos, making shirts, etc. It’s been quite the humbling ride. 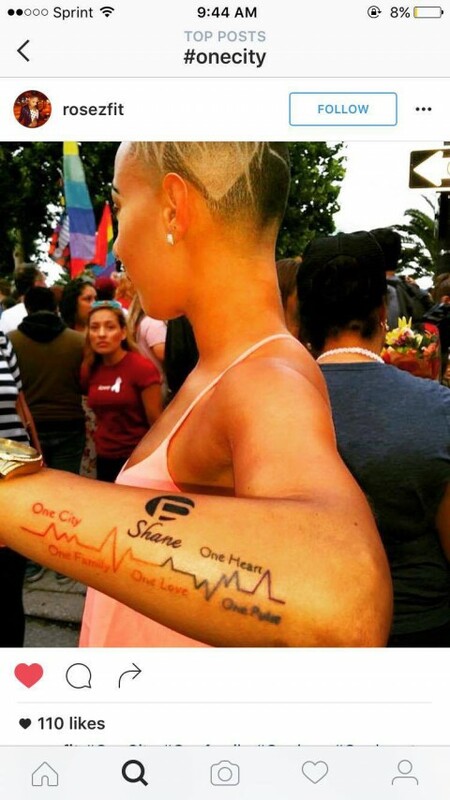 Arissa Montigny contributed the “one love” phrase to the original paintings, but it’s mind blowing that a painting I put together in 45 minutes, inspired someone to get a tattoo… It’s now on someone’s body, forever. 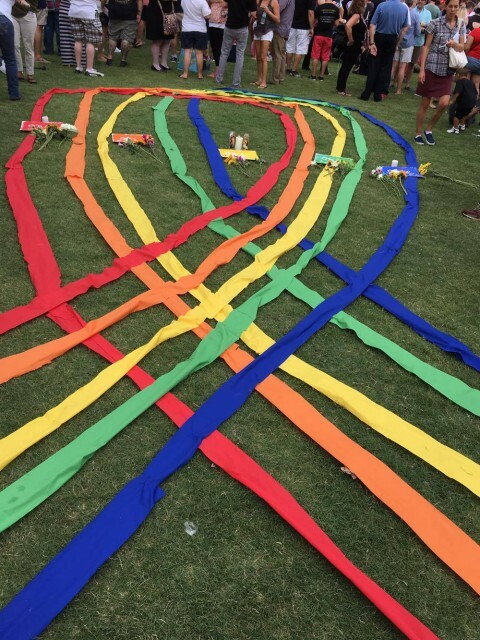 The ribbons will be at the Orlando History Museum… their home will be at the Orlando History museum since its really large. 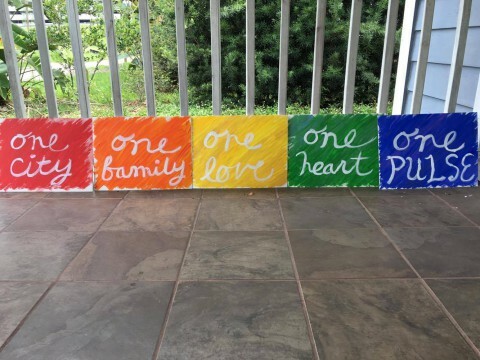 The series of paintings will be at the Pulse Memorial. If/when the opportunity presents itself both pieces will be at any museum on loan for any temporary exhibit. I’m honored that you are including this in your blog/article. It was such an honest artistic moment and has touched many lives. So moving forward it’s important that it’s remembered, forever. Charlie Schaeffer, the artist, prefers to be texted (8502949587) upon first contact, but his email address is Charlie.schaeffer11@gmail.com. 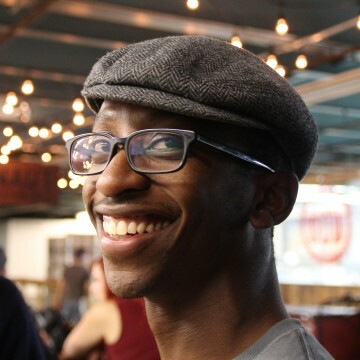 Thank you, Lawrence, for thinking out loud, and for weaving this beautiful post pointing to interrelatedness and the counterbalancing force of love! On June 12 I woke up a few minutes before 6:52 am to see the Facebook posts of a coworker from Winnie Palmer Hospital about being on lockdown due to an active shooter threat. Winnie Palmer Hospital is part of Orlando Health and is located just a block away from ORMC. (Note: there never was an active shooter at either hospital.) 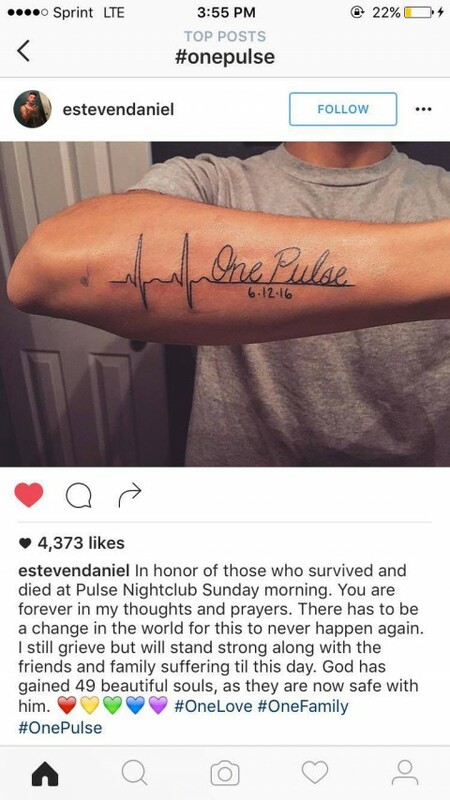 The first thought in my head is about my brother, who used to work at Pulse. What if he was there? What if he got his job back and didn’t tell me? What about his friends? Luckily, I was able to determine he was at home sleeping within a few minutes. I wish that were the case for all families impacted that awful, terrible night. I turn on the news and see information about my employer, Orlando Health, running across the screen. “Orlando Health asks that all team members not scheduled for work to not come in.” At this point I was under the impression that the number of victims was much, much lower. For some reason, I remember thinking I heard the number nine. Still awful, terrible, unthinkable, a horrible loss for their friends, family, the community at large. I thought about the people that were there that day. Who did I know that might be working? How are they? I wish there was something I could do to help. I wish there were anything I could do to help. My son and husband woke up shortly. I moved into the bedroom to watch the news. I had to shield my five year old baby boy from hearing about the horror. I remember only eight short months ago trying to determine what is appropriate to share about the Paris attacks with a five year old. In March I was in Washington DC when the Brussels airport was bombed. As I watched my ten year old nephew and seven year old niece read the news on a muted television as we ate lunch in a restaurant I came to the awful realization that my son would be reading soon and it would be much harder to filter the details of tragic events. When Mayor Buddy Dyer announced the number of victims was 50…I crumpled. On Monday I felt it too- the twisted stomach, the lack of focus Lawrence described. Going to my office, less than one mile from both ORMC and Pulse, I was in a total fog. The leadership team in my office called us together to talk and my director had the idea of making a poster of some sort where people could write their thoughts in response to the tragedy. Later my manager and I walked to Target to get some supplies. Still not thinking straight, we wondered aimlessly through the aisles not sure what to get. Then I remembered a screen shot I took on my phone the day before of art that, despite everything going on, made me smile. 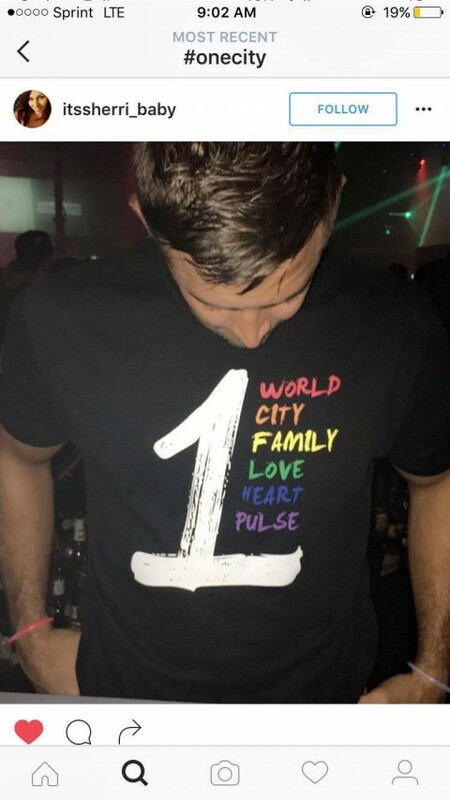 It was said “One City, One Family, One Love, One Heart, One Pulse”. “Let’s make this”, I told my manager. She loved the idea. We bought the supplies and our team worked together to create a poster. We didn’t have the skills of the original artist, so I can’t say it looks as good as his. But coming together to work on that poster was therapeutic. We hung it in the front of our office. In hindsight I should have asked first. But now the only thing to do was wait. Over the next few days, my team received a few more requests for more posters. One for the ORMC Emergency Department. Going there to deliver it, to be surrounded by heroes, was surreal. One for the Talent Acquisition team. I assume to place in their office so that when applicants come in to sign their hiring paperwork, they can be reminded of what an amazing place Orlando Health is to work. I am so proud of our entire team’s response. The doctors, the nurses, patient business, guests services, environmental services, our leadership, our CEO made me so proud. But that is another story for another time. Charlie and I continued to write a few short messages back and forth, here and there, over the next few days. I sent him pictures as the posters had notes added to them. He sent me the video link about the homeless man who dedicated himself to keeping the candles lit at the vigil. He told me about how his employer graciously offered to help support ORMC. Our internal communications team made a video about Orlando Health’s response and it included a snippet of the posters. I forwarded to Charlie. His responses were always so beautifully worded, so touching. It meant something to me to have created a bond with a total stranger through this. It meant a lot. All this to say…I agree. Art can weave us together. Thank you for sharing your words and thoughts, Lawrence. I, too, felt this in my gut. Imagining someone taking the joy and life away from so many people — and moreover, causing terror in a place where people felt safe. 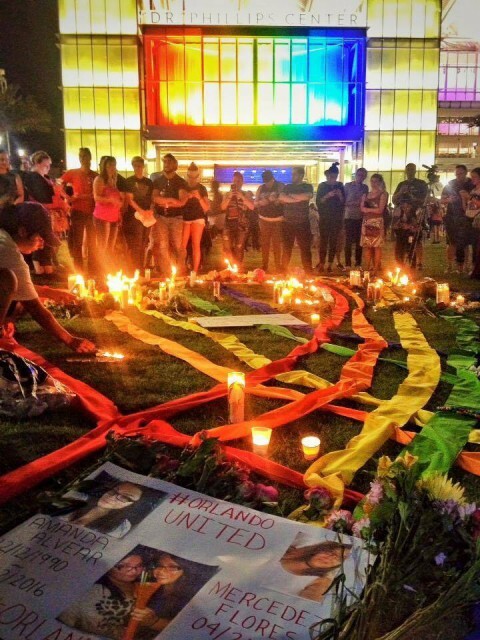 This was a horrific act in the midst of what has been such a tremendous set of moments for the LGBTQ equality. No words can express the full gravity of this tragedy. 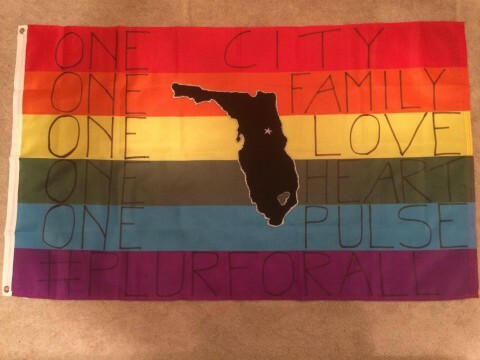 But we can all rise up and work to make our communities safer and more accepting for the LGBTQ community. If there are ways you’d recommend to move on this, I’m sure you’d have lots of open ears to this (myself included). Charlie and I are in conversation and if we come up with something specific, I’ll definitely let you know! Thank you Lawrence and Charlie! I am just seeing your post. My physical processing was in the form of a heaviness in the chest, like carrying an extra weight that made me want to curl up into a ball at times. Thanks so much for sharing this Lawrence! It’s really beautiful. I love you so much and am so beyond blessed to be working with you. It has been a month sense this horrible tragedy and reading all the feedback and comments gave me goosebumps and some tears. I’m currently having a dialogue with Orlando City Hall to open an art exhibit next June to inspire more healing and change in the future. I will keep the Interaction Institute and Lawrence updated. Thank you all for your kind words, it has been truly moving.